This is the second Hamilton 921 pocket watch conversion we have made available for purchase, our first one has been sold. This watch doesn't need a lot of words, its raw beauty and performance speaks for itself. ClockSavant provided design input into this watch in collaboration with a very talented and dedicated outside watchmaker who performed all of the work in sourcing, servicing, and manufacturing the watch. This is a true one-of-a-kind design. The vintage movement is a made-in-the-USA Hamilton Calibre 921 vintage pocket watch manufactured in 1947. This was one of Hamilton s finest movements. The movement was removed from a pocket watch, completely disassembled and serviced by the outside watchmaker working with ClockSavant, and then custom fit and assembled into the new modern case. We fitted a high quality deployant which was finished to match the case of the watch. If anyone ever asks you about the quality of made in the USA watches, you can show them the Hamilton 921 movement through the exhibition case back and their eyes will likely glaze over with admiration. 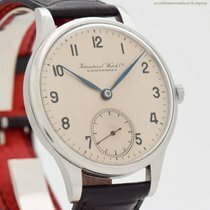 We made great watches in the USA and it s a shame we don t make them any more. There are fledgling watchmakers working to recreate our history, and at ClockSavant we work to do our part by keeping horology and watchmaking alive with innovation, passion, and excellence in the USA. This is a large 42mm watch, if you like larger watches you will it very much. It has a pilot aviator inspired design with a unique satin sandblasted finish. The front and back crystals are made of sapphire with antireflective coating. The service work was performed by an outside watchmaker under contract with ClockSavant in approximately 2012. The watchmaker disassembled, old and worn parts replaced or repaired, adjusted, optimized, cleaned, and lubricated. ClockSavnt has performed comprehensive testing and performance measurement. Warranty: 2 month warranty-- customer misuse, neglect, accidental, intentional, or unintentional damage are excluded from the warranty. See the Support page of our website for detailed warranty terms and conditions. For non-warranty damage, please contact us to obtain an estimate for servicing, repair, and restoration services.